1. Heirloom Tomatoes are arriving in markets. 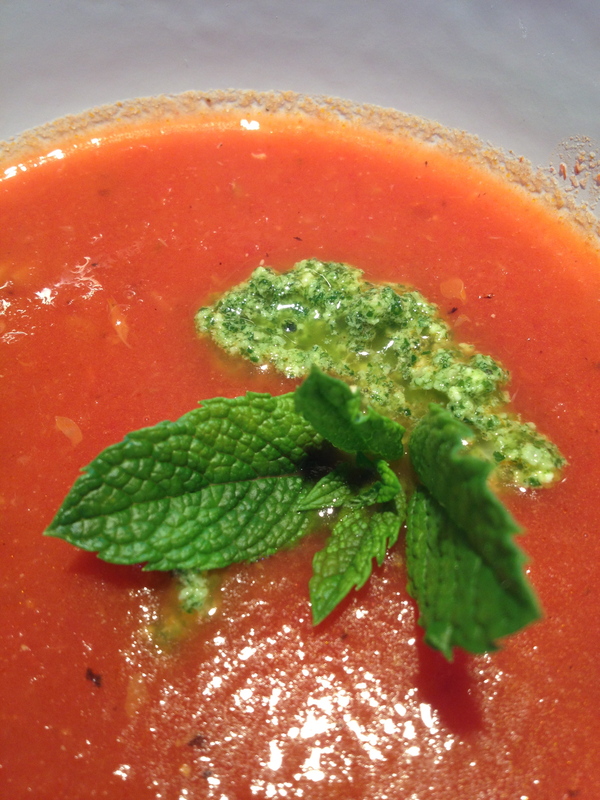 And, 2. we wanted one more vehicle for Mint Pesto, so homemade tomato soup. You’ll find heirlooms in yellow, orange, green, purple…, but select firm, pretty, red fruit for this soup. Because our tomatoes aren’t ripe, because good quality canned ones are available, and because you might want to make this in the winter to serve with grilled cheese sandwiches, we suggest Muir Glen Roasted Diced Tomatoes as an alternative to fresh. 1. Heat the olive oil in a large stock pot. Add the onions, celery, and carrots and cook until they begin to become tender. 2. Add the carrot greens or parsley and garlic, and continue cooking until the vegetables start to caramelize. 3. Add the tomatoes, herbs, honey, lemon juice, pepper and salt, and continue to cook uncovered over a low heat for an hour. If the (soup) becomes too thick, add a little water as it’s cooking. If you have the time, cover and simmer over a low heat for another hour. 4. Let the soup cool enough to handle. Strain the solids, returning the (broth) to the pot. Pulse the solids in a blender or food processor. The consistency should be “rustic” – not too smooth. 5. Return the puree to the soup pot. Reheat, correct the seasoning and serve with fresh Mint Pesto and garnish with some freshly picked leaves. Note: this can also be served cold. 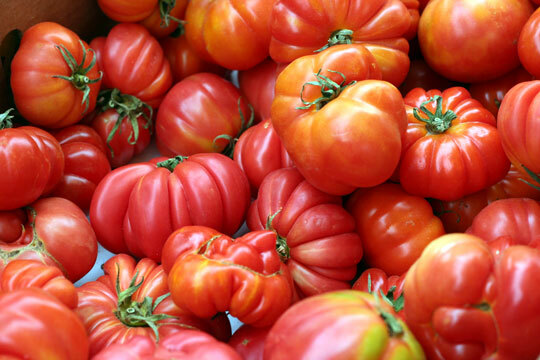 Firm, pretty, red heirloom tomatoes = great taste! Tags: fresh tomato soup, Gluten free tomato soup, heirloom tomato soup, summer soups. Bookmark the permalink. Previous post ← Monday Mantra: It’s the thought that counts….